Hawaii is a place where most people would call a “paradise.” The water is blue and the weather is warm year-round. However, underneath the ground lays tons of molten rock that at any day can erupt. This is what’s occurring on the island and its making people leave their childhood homes and causing millions in damages. Over the weekend, Hawaii’s biggest volcano Mt. Kilauea erupted causing boiling lava flowing down its sides and into the neighboring towns. Mt Kilauea has been active for the last 35 years, but it hasn’t erupted since January 3rd, 1983. Neighborhoods like Leilani Estates and Kapoho are in the path of the lava flow and residence are being urged to evacuate. Mt. Kilauea has been given the nickname “Pu’u O’o.” which means “big island” The island has eight major volcanoes and due to this the island grows an average of 42 centimeters a year due to all the molten lava hardening and making the island bigger. 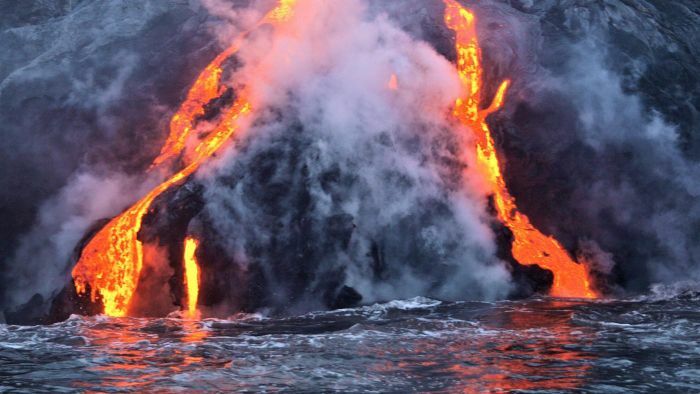 Hawaii was solely created off underwater volcanoes that continuously erupted which formed the eight main islands. Just recently, concern has been mounting due to the lava flow of the volcano inching closer to a power plant that is holding flammable liquids. If the lava gets to the power plant, there is a great chance of an explosion happening and causing more damage than previously thought. There has also been concerns over all the smoke coming out from the volcano. All the smoke mixed with dangerous carbon monoxide is causing disruption in air travel and is creating volcanic ash when it hits the ground which can damage houses, vegetation, and can cause humans to obtain cancer if they inhale too much of it. The problems stemming from Mt. Kilauea are only the beginning and as days and weeks happen after the eruption stops. The damages will be drastic and unfortunately entire families way of living will be completely evaporated as the rebuilding process begins to start when the volcano is finished erupting. Volcanologists are now worried about other volcanoes around the Ring of Fire (an area that houses numerous of volcanoes stemming from Hawaii to the western coast of the U.S.) on the brink of erupting. If this turns out to be true, we are in for a treacherous time. Hopefully they are wrong, but initial graphs are showing these volcanoes (Mt. Rainier. Mt. St Helens, etc.) starting to become more active after this recent eruption with Mt. Kilauea.